Yin Yang, What Is The Meaning Of The Yin Yang. Is The Significance Of Yin Yang Relevant Today. Most of us have seen the yin yang symbol at some time or place, but not all of us know the true interpretation and meaning of the yin yang. So what exactly does the yin yang mean, is the yin yang a religious symbol. Is this historic symbol relevant to us in our modern day lifestyles, or is it popular just because it is old and has a Chinese origin. In this brief report on the significance and meaning of the yin yang, we will talk about some very interesting aspects of this symbol. You will also learn how to harness the benefits of what the yin yang implies to your daily life and profession. It does not matter what religion, age, nationality, gender or profession you belong to. The yin yang has something to each you, something that is bound to make your life better. The yin yang is one of the most meaningful symbols in history. The interpretation of the ying yang make it relevant to all of us, no matter what age or religion we belong too. The black and white contrasting colors are placed next to each other. The exist in harmony and seem to be flowing into each other. 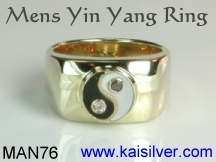 The above yin yang symbol is taken from the Kai Silver custom jewelry website. In this report we are not interested in yin yang jewelry but, will spend our time talking about the meaning of the yin yang and how it can help us better our life and lifestyle. Let us first describe some intricate details of the yin yang as shown above. You will notice that in most cases, the colors used for form the yin yang are black and white. The meaning of this ancient Chinese symbol implies the existence of two opposing forces, bodies or temperments next to each other. The important thing is that these two opposing forces seem to exist in perfect harmony, their shapes almost make it appear that they flow into each other or embrace each other. There is still more meaning to the yin yang, and this is referenced in the two small spots that you see in the black and white portions. Notice that each spot is in the opposite color as compared to the background color. So you have a white spot in the black portion and a black spot in the white portion. These two spots imply that, there is a part of the opposite force, mood or tempertment in each of the segments. Nothing is fully good or fully bad, there is nothing like pitch darkness - this seemingly small aspect of the yin yang has great meaning for our daily lives. Now let us look at how each of these features of the yin yang which actually give it meaning can be relevant to us today. We will not presume or assume any religious or nationality characteristics when doing this. Black And White: The yin is represented by the black portion, the yang by the white portion. Basically this feature implies that there can never be just one school of thought, one idea or one condition in our life. We will need to accept the fact that some or many people could differ in their opinion regarding the same thing. This could as simple as someone avoiding alcohol and smoking totally and another person, being almost addicted to the same. The meaning of yin is traditionally taken to mean, night, rest and relaxation, soft, feminine or at one extreme something that is right. On the other hand yang implies - day, activity, hard, masculine and in the extreme something that is wrong (not right). In life there will always be good times and bad, and the meaning of life cannot be taken to mean only happiness or only sorrow. Harmony: The significance of the yin yang, is aptly represented in black and white - the two opposing forces. What is important in interpreting the black and white portions of the yin yang symbols is that, the two opposing forces live in harmony, they reside in peace next to each other. A good example would be an office with many staff doing many different tasks. You might not like the attitude of a particular collegue, but the skills and expertise that she brings to the organization might make an important person. You would need to learn how to get along with that person, and more importantly ensure that your impression of that person does not negatively affect the office work. Another good example of the need to live in harmony despite individual differences, would be a married couple. You love to watch the soap operas on every TV channel, your husband loves to watch the baseball game. It is not easy for you to stop watching your favorite TV show and instead, get excited about baseball. Your husband would not want to change his preferences too. The fact would remain that, you two have many other interests and habits that actually brought you together. Without losing focus on that, you will need to sit down and discuss some suitable schedule and time - something that allows both of you to get time to watch your favorite TV programs. Living in harmony does not mean changing, the opposite person to become exactly like us. Dynamic: Just as there is no stark or straight line dividing the two opposite forces in the yin yang symbol, life is always made of dynamic situations too. Just as night flows into the day, even the most depressing conditions in our life will pass away. Like the meaning of the yin yang, where no situation, condition or mood is static - we need to keep a positive attitude at all times. There is a dangerous element about being negative all the while, it could lead us to ignore or miss some very good opportunities that pass by. Just keep in mind that the yin yang is not about dreaming that all is well and fine. It is about living life and learning to cope with tough times and being fully aware that, there will always be opposing forces in life. In a similar way, we need to be in control during the good times too - much like how the winner needs to respect the loser. Or keeping your expenses and fancies in control when business or profession seems to be going great. Spots: We now get to the small spots with a big meaning in the yin yang symbol. Activity, power and energy are symbolized by the yang, the black portion of the yin yang. But you cannot have 24 full hours of activity or energy, you need rest - that is represented in the white portion of the symbol. Inorder to rest and refresh yourself for another hectic day at work or business, you will need some rest. This is what the white spot in the black portion represents. Similarly, the white portion would represent yin, relaxation and passiveness. Compare this to a holiday or vacation fun time, time for drink and food BUT, you still have to stay in control - remember you have a family and job to get back to. This is what the black spot in the white portion reminds us of. This does not mean that you should not fully enjoy a holiday nor does it mean that, you should not give 100% to your job or business. All it means that, you will always need to take some rest or take some responsibility, irrespective of what you are doing now or what is important for the moment. Practice: You now know the significance and meaning of yin yang. Without giving much thought to where it originated and which religion it originally belonged to, you will need to harness the benefits of the yin yang to help you in your life. We did menton above that yin yang is not a religion, so you do not have to go to a church or temple to practise it. Similarly, it is not something like yoga for which you need to keep time aside each day or week to perform or practise. First learn the meaning of yoga, then sit back and see how it can be applied specifically to you. Once you have seen an improvement in yourself, recommend it to someone else. The main thing is that, you need to weave the yin yang concepts and symbolism into your lifestyle. When you do this, it becomes a part of you and you need do nothing more to reap the benefits. We do hope that you have enjoyed and benefitted from this report on the yin yang. The report was compiled by the Kaisilver team. While we are not directly related to feng shui or any specific religion, we do take time out from our regular highend custom jewelry making activity, to share some interesting information or concepts that we come across. It is our way of giving back something to society - our progress and establishment in the gems and jewelry industry, has been supported by a wide section of wonderful people from across the globe. Share this link with your friends, relatives and collegues if you have found it useful. They will be glad that you cared to do so. A classic example of yin yang jewelry. A mens yin yang ring with black onyx gem stone and white mother of pearl. This gold or 925 sterling silver yin yang ring also includes a white diamond and a black diamond ... more. A gemstone yin yang ring, the center iolite gems tone is flanked by two etchings. The right side has a yin yang symbol and the left side has a lightning symbol. Custom made in gold or 925 silver with your choice of etchings ... more. A subtle representation of the yin yang on this plain band ring. 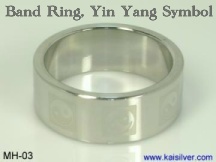 A row of yin yang symbols is lightly etched all over the band of the ring. Can do deeper etching as shown in the MAN31 ring. 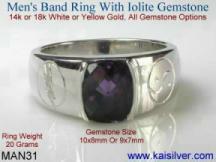 Custom made in all ring sizes, gold or silver ... more.